Have the challenges and demands of motherhood sucked the life out of you? Could you use more joy in your life? Do you want to fall back in love with being a mom? Then this 30-day joyful motherhood challenge is exactly what you need! Written by a fellow mom, this book will meet you right where you are in the trenches and extend a hand to lift you up. Up to a place of greater joy and renewed purpose in motherhood. Up to a place of peace and contentment in your home. Up to a place where you love the ones you’re with … and they love being with you! 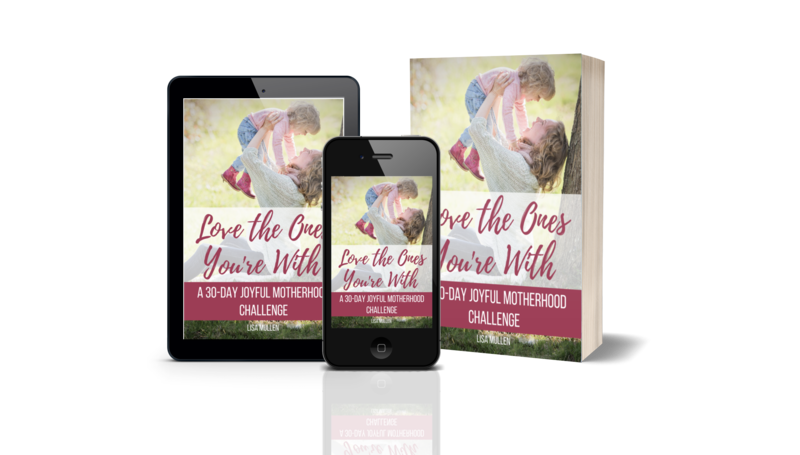 Whether you’re in a tough season of motherhood or you just want to add a little more joy to your days, you will want to take this challenge. If that sounds like something you could use in your life, then I invite you to join me in the journey to Love the Ones You’re With. The challenges are simple yet effective — What a great read, I love that each chapter was short and simple and not overwhelming. Every challenge in the book really does lead you to be a more joyful parent if you let it! Would be a great book to read with other friends and do the challenges together day by day. Easy read with practical tips! — Lisa has a way of providing practical ways you can be intentional with your children which ultimately leads you to become a joyful mother. Any mother can make the time to go through this devotional!